What comes to mind when you hear the name Babylon? Babylon is often used as a symbol of man’s rebellion against God. 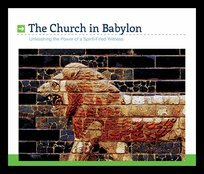 Thanks to their rebellion, the Jews were eventually carried off into Babylon, where they tried to maintain their faith in the midst of a pagan culture. These messages from the book of Jeremiah walk through what happened before the coming of the Babylonians and the destruction of Jerusalem. We will see parallels to our own nation; more importantly, we will look into our own hearts and see that we, like generations before us, must prepare for dark and difficult days. These messages are intended to motivate us to be faithful in a pagan culture that is under the judgment of God.